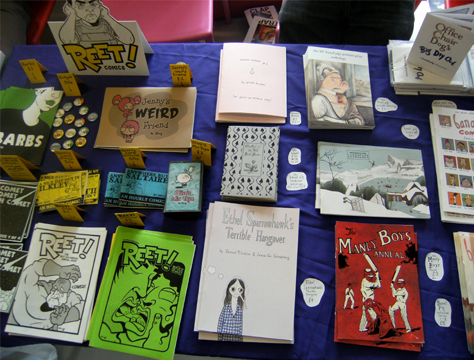 The 5th Leeds Alternative Comics Fair will be held at A Nation of Shopkeepers, Leeds, on Saturday 8th December 2012, from 12 noon – 5pm, featuring untold comics, zines, cards, posters and other items to amuse, entertain and educate. Due to limited table numbers we will be inviting exhibitors to take part. Anyone else wishing to participate can bring their comics down, where we will have a communal table. All we ask is that you help man it for an hour (or longer, if you like!). It will be free to enter and the bar itself is open until 3am, serving good food and a large selection of drinks. Here are some pictures and thoughts from our first and second events! Hi If I wanted to put some books on the communal table can I just turn up on the day to do that or do I need to arrange it in advance with you? hi sean, yeah you can bring them along on the day, that will be fine. This has been a really nice event, and also good comics… hope there will be a 4th edition!